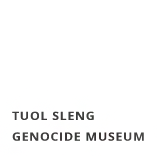 The permanent exhibition displays a history of the Khmer Rouge rule from 1975 to 1979, and mainly focuses on the crimes committed in the former S-21 prison and torture center. Visitors can see on display evidence, including photos of victims’ and staff members of S21, victims’ clothes, torture tools, shackles and chains. The Museum also houses a gallery of the paintings of Mr. Vann Nath, a survivor from S-21 and one of Cambodia’s mostrenowned artistis, depicting scenes of torture and living conditions at the prison, displayed in Buildings A, B and D. Building C is preserved exactly as it was during the Khmer Rouge time.